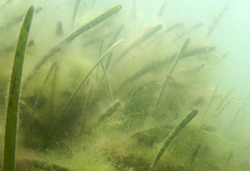 As with any surface in the marine environment, seagrass leaves provide a place for planktonic organisms to settle. When they settle on seagrass leaves, they are called epiphytes (sessile organisms that grow on plants). Epiphytes of seagrasses include algae (micro and macro), bacteria, fungi, sponges, bryozoans, tunicates, protozoa, hydroids, crustaceans and mollusks. Of all of these, algae are the most abundant and diverse group to colonize seagrass leaves. 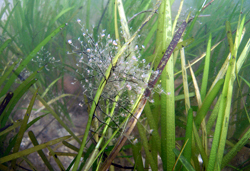 Algal epiphytes significantly contribute to the primary productivity of the ecosystem (20-60%), and form the base of many food webs within seagrass communities. Algal epiphytes are directly consumed be grazers such as snails and sea slugs (learn more…). The distribution and abundance of epiphytes is influenced by several factors including light, temperature, water motion, nutrients, seasonal/successional changes as well as grazer/predator interactions. 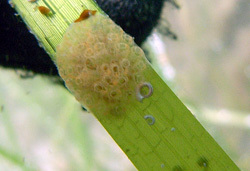 Since seagrasses are constantly producing new leaves, they are constantly creating new areas for “fouling” organisms to colonize. For most seagrasses, the oldest parts of the plant are the most fouled, which are the oldest leaf and the leaf apexes (tips). These areas contain the highest biomass and diversity of organisms. Eventually the oldest blades, often heavy with epiphytes, are sloughed off by the plant. The load of epiphytes directly affects the amount of light that can reach the leaves of seagrasses. In healthy seagrass ecosystems, epiphyte/grazer/predator interactions help keep the system balanced, but algal epiphytes can become excessive due to nutrient loading and can lead to seagrass die-offs if the plants aren't recieving enough light. Larkum, A.W.D., Orth, R.J., Duarte. C.M. (Editors), 2006. Seagrasses: Biology, Ecology and Conservation. Springer.